My local town is, and has been for close on 45 years, Devizes in Wiltshire. When I drove into the Market Place the other day I was shocked by a structure I didn’t, at first, recognise. But then I was driving and concentrating on other traffic and pedestrians using the crossing. I was able to park the car and get a photograph. 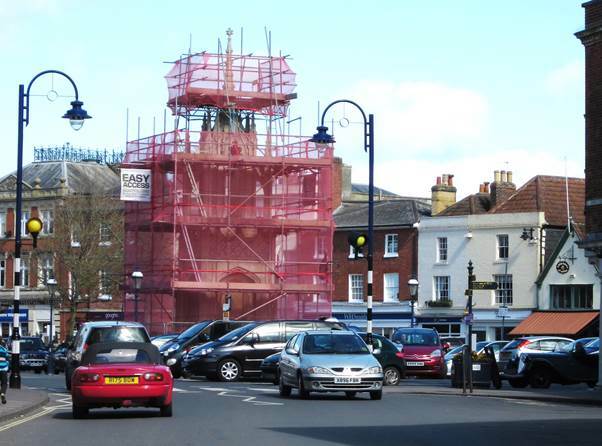 It proved to be the Market Cross under wraps. Presumably it is getting a bit of a spruce up. Having lived in the area for 35 years I take these things for granted but I have found a photo I took of some classic cars around the Market Cross on a very wet day in May 2004. You might notice there’s a metal plaque on the cross. That tells the tale of Ruth Pierce. This extract is from A History Military and Municipal of the Ancient Borough of The Devizes, by James Waylen. 1859. It tells the tale of Ruth’s attempt to be dishonest and her rapid demise. So let that be a lesson to one and all!